I was visiting at a close friend’s house and decided to treat the family to supper. It was a small town and so the options were limited. After talking about possibilities we decided on some ribs. The father of my friend especially loved ribs and I was excited about doing something for him. As we drove to the restaurant to pick them up my friend said, “My dad is going to complain about the ribs. He’s going to say there isn’t enough meat on them and they don’t make them as well as a place he used to eat in another city. He will not only be critical of the ribs, but will tell us in great detail how they made them at the other place and go on and on about it. Not a positive word will be said about the food”. I challenged their statement. “Now you don’t know that! He might enjoy these ribs and not say anything. If you expect him to be negative and he isn’t, you have become unnecessarily cynical”. Their opinion didn’t budge. “Well, you don’t know my Dad! I promise you, he will complain and not have anything positive to say about the food when we bring it home”. I felt sorry for my friend. The negative spirit and griping of the father had influenced them to be the same way. Secretly I hoped he would respond the exact opposite of what was expected, or at least to not say anything. Maybe my friend would be taught a lesson about having a bleak outlook! We arrived home with the ribs, opened the box, and everyone gathered around and filled their plate. It wasn’t two minutes into the meal when the father began to complain. In fact, he said exactly what I was told he would say – to the letter! I sheepishly glanced at my friend and received an “I told you so” smirk. Usually I would have thought it was funny, but in that occasion it was very sad. It happened almost forty years ago, but I still remember it. It was tragic and I felt bad for his family. He had griped so much that it was a way of life, a pattern that dug a groove in the mind of those he knew the most and for whom he should have cared more. Could anyone in your family predict your negative attitude or even your specific words concerning a situation? A family member that regularly gripes trains others to expect the worst from them. Worse, the complainer influences others in their environment to have a negative outlook. It’s like a spiritual virus that jumps from one person to the next. Before one complains at work, church or school, they first do so in their family. People don’t initially complain publicly, but privately. It happens behind closed doors to those closest to them; their loved ones get the brunt of it. This is clearly referenced in the Bible. After being in difficult circumstances wandering in a desert because of their unbelief the Jews began to complain. It’s interesting where it started. God’s Word states that they “…murmured in their tents…” (Psalm 106:25). Because they were nomads they traveled and lived in tents. So their murmuring was poured on those closest to them, their family. They “murmured” about God and expressed their discontentment. Murmuring is a synonym in the Bible for griping or complaining. Griping is speaking negatively to another person about something which they can do nothing. My friend’s father had done this for so long that he had created an expectation from his family that he was going to be negative, to the very words he would use. We can gripe with them. We can rebuke them for their negative words. We can be quiet, endure it and wait until we can leave them. Each of the above responses involve tension and establish a culture devoid of peace and joy. Yet this is the environment of many families where griping is the norm. And when it happens consistently the griper influences others to either (1) become like them or (2) to distance themselves from the one that is creating a toxic environment. The “stalled ox” speaks of one that was kept in the stall, being fatted to eat later. This was a sumptuous feast of steak! A “dinner of herbs” refers to a simple meal because they couldn’t afford something better. God is saying that a home of poverty filled with love is superior to a home with plenty but was filled with hate. Another text emphasizes the truth in a different way – “Better is a dry morsel, and quietness therewith, than an house full of sacrifices with strife”. (Proverbs 17:1) A “dry morsel” was a portion of stale food, and a “house full of sacrifices” referred to a feast of plenty. It’s far better to have a home of poverty with “quietness” and peace than a wealthy family that experiences “strife” and contention. One more Scripture teaches the same truth from another angle – “It is better to dwell in the wilderness, than with a contentious and an angry woman”. (Proverbs 21:19) Though the “wilderness” is not an ideal place to live and uncomfortable, it is preferable to living with one that is argumentive and angry. Someone said, “Home is the place where family members go when they are tired of being nice to other people”. We tend to be nicer to strangers than those we know and love the most. We save our negative words for family and friends and hold them from others. When a griper enters an environment they “curse” it. I’m not speaking of profanity, but of establishing a negative spirit. It happens every time. Your negative words and attitude drain any hope, expectation, and brightness and replace it with an atmosphere of pessimism, hopelessness, and discouragement. A negative disposition curses anything it touches and makes it worse. A complaining parent affects the home in a much more negative way than we could ever understand. It is destructive and reproduced in the generations to follow unless someone decides to deal with it and conquer it through God’s help. My good friend predicted what their father would say and also had a tendency to see the negative things rather than the positive that was occurring in life. It’s tough (but not impossible with God’s grace) to break the cycle. It’s just sad that it happens to so many children. Many with critical and fault-finding perspectives learned it at home in “the tent”. Even if you have experienced a terrible tragedy it doesn’t have to mark your life for bad. Wherever and whatever you are in life is a sum total of the choices you have made and the thoughts you carry. A complaining spouse affects the marriage in a more destructive way than they realize. Griping doesn’t build intimacy, but facilitates a relationship based on what is wrong rather than what is good and right. “Often the difference between a successful marriage and a mediocre one consists of leaving about three of four things unsaid”, wrote Harlan Miller. Most of these spoken words that undermine a marriage involve complaining and criticism. Taken at one of our favorite places – Orange Beach, Alabama. We have so many precious memories that we will carry for the rest of our lives. I love my family. They grow up so fast. These were special days for Paula and me. A personal question and evaluation: who is the biggest complainer in your home? If your family took a vote who would get the most votes? If they were going to evaluate you on a scale from 1-10, with 10 being the highest, where on the scale would they put you in terms of complaining? Years ago I had a debilitating, migraine headache. I went to bed early, shut the door, and lay there in complete darkness praying for relief. 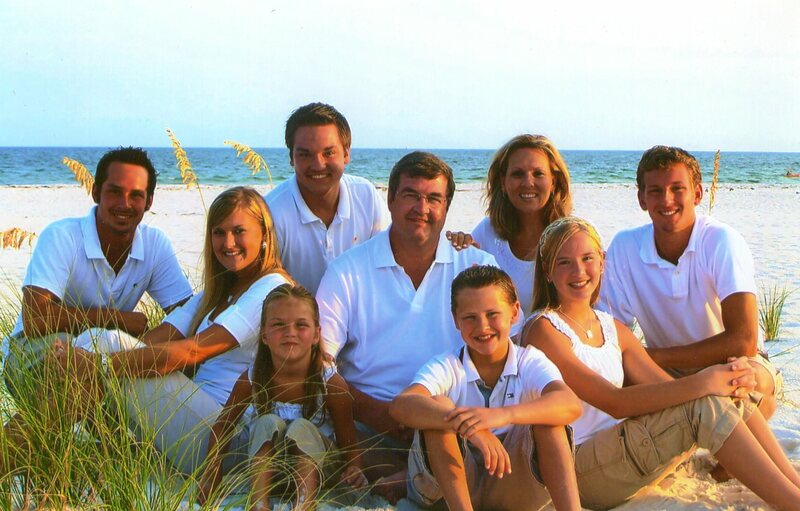 God has blessed us with seven children and it’s no fun having a Dad who tires easy and often has bad headaches. As I lay there I was asking God to help me with my children that they might have mercy on me and not be disappointed because of my limitations. Sleep doesn’t come easily with migraines and you are acutely conscious of sound and light. After about an hour I heard the door open and a sliver of light spilled in the room. Someone entered very quietly and I supposed it was Paula. I didn’t move or say anything, holding a pillow over my eyes. Someone tiptoed right beside my side of the bed and picked up something they needed – or so I thought – and then left, shutting the door and leaving me alone. Finally I fell asleep and was able to rest. In the morning I got up and had forgotten about someone coming into the room while I was hurting so bad. I glanced on the nightstand and there was a note from my son, Jon. On the outside was just the simple word, “Dad”. It was him that had come into the room the night before. As I sat on the bed and read it my eyes filled with tears and then they rolled down my face. It was filled with words of gratitude for things I had done for him and words of encouragement. I already felt guilty for not being able to be the father I wanted to be, but rather than complaining to me or the family he chose to focus on the good. His positive and kind words not only blessed and helped me, but I have never forgotten them. In fact, I still have the note. Will your family remember you as being a complainer or one that encourages and sees the blessings in life, having a heart of joy and gratitude? 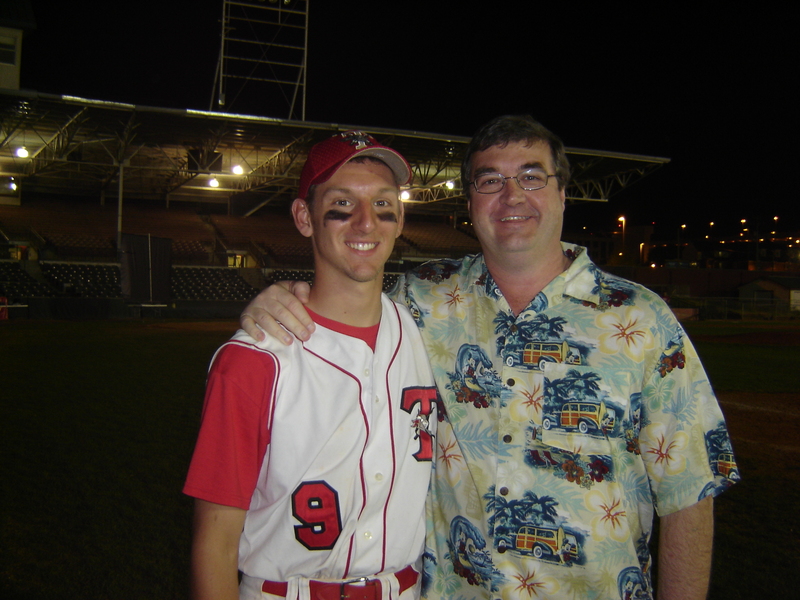 My son, Jon, and myself after one of his baseball games in college. Friend, your family will remember your words of praise, encouragement, and hope and treasure them not only the moment you give them, but for the rest of their lives. Yes, complaining affects a family, but so does praise and encouragement. Don’t “curse” your environment, but bring a blessing to it. May we be the kind of people that can find something good about the ribs rather than what we don’t like about them! Our children are listening and learning from us. This entry was posted in Children, close family, closeness, Complaining, Criticism, disagreements, Encouragement, example, expectation, Family Issues, Gratitude, griping, Influence, praise and tagged children, close family, closeness, complaining, criticism, disagreements, encouragment, example, expectation, family, gratitude, griping, influence, praise. Bookmark the permalink. This is a beautiful article…I was just thinking how it’s time for a family meeting and I was planning to focus on all of the things that aren’t being done well in our house. Instead I’m going to start by reading your article and asking how we can work together to work out some of the kinks! Thank you for the boost of Vitamin D !!!! Thank you Bro Rick for these encouaging words. God has used you greatly in my life. Thanks for all you’ve done for me and my family– I love you!! Teaching SS out of Numbers 11 and 12 tomorrow. To say this was “timely” is an understatement for me. Thanks for sharing. …In Christ Alone!